Just go and enjoy it's perfect. Building work until Oct 2014 near Romantica restaurant, request room on opposite side of resort. 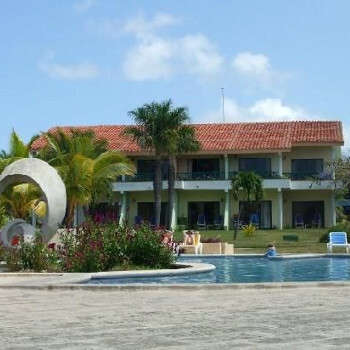 The hotel is located on a small beach, between the Playa Pesquero Hotel, and the Blau Verde Hotel. But there’s nothing else around, no shops, bars or village. Guardalavaca is accessible by a bus from the hotel for 5 CUC return – but to be honest, there’s virtually nothing there either, other than a small craft market. Holguin City is about an hour away, and most folk go either on a day excursion (which includes a steam train ride) or night excursion (which includes a show). However going into the shops in Holguin is a very sad experience. One sees just how poor the Cuban economy is, shops have virtually no stock, and what there is, is of poor quality. pretty clean apart from the rats, awful entertainment beach was ok apart from sand fleas, and waiting for sunbeds, not ever would i go here again nobody should. It is quite a large resort with two hotels sharing the pools, beach, restaurant and other facilities. The gym is a shambles,there is no air cionditioning and most of the equipment is old and broken. The saving grace was the beach which was absolutely stunning and gorgeous. beware of the usual beggars though. its also best to go early to grab a parasol as the sun is very strong. The poolside was also quite nice and again its hard to get a poolside lounger unless you went down at 7am to claim your space. The resort area we stayed in was beautiful the beaches were lovely. The people that lived in these area's where friendly and welcomed tourists. Cuba is a very nice island however I don't believe that I would return again. There isnt much in Guadalavaca, we didnt go but people we spoke to said there was just a small market there not much else. We did go on a horse and cart into the small village near the hotel that was nice, the country side is beautiful and gives you a little bit of insight into how the Cuban people live. everywhere was clean as loads of cleaners and gardeners all over non stop.one reasturant could of been cleaner toilets espesially in ss/grill but all in all couldent fault the place on a whole.entertainment wasn't my cup of tea but beer garden did me.beech once sea calmed down was loverly but better still if you kept walking to your left you come to a small path through some bushes go down it and you will come out on a beautiful sandy cove crystal clear calm shallow waters and a blue river running into the seathis was our best spot.anybody taking fishing gear think heavy because some big fish with sharp teeth about. Superb, we wish we were back!